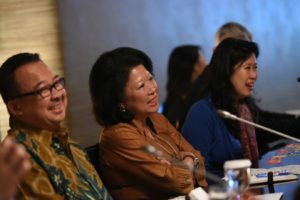 APC kicked off our second annual meeting in Jakarta with an insightful sharing on the cross-section of philanthropy and society by former Indonesia Minister of Trade Prof. Mari Pangestu, and social entrepreneurship champion, Prof. Rhenald Kasali. This year, we travelled to Indonesia as our membership there had grown to 8 members, spurring the launch of our Indonesian chapter. Besides the full day of sharing on philanthropic projects, we extended a second day for a workshop with expert presenters on “Preventing Radicalism” – Yenny Wahid, Islamic activist and daughter of the late President of Indonesia Abdurrahman Wahid; and Sidney Jones, Director of Institute for Policy Analysis of Conflict. It was an astoundingly informative session on the current social climate and profiles of radicals. Later on, we were brought on a site visit to a low-cost housing community, which is supported by GK Indonesia. Even as we come together to learn through expert opinions and experiential learning, members also contributed their thoughts and commitment for further collaboration in 2017; with more programmes, bigger ambitions and deeper impact. There are separate articles in this issue on the last two sessions.